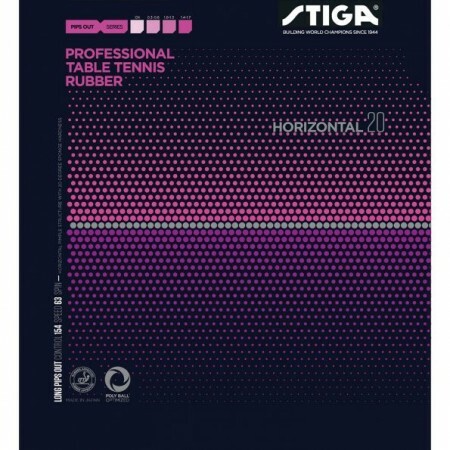 STIGA Horizontal are our latest long pimple rubbers, developed in close collaboration with former Japanese National Team player Masato Shino. The pimple structure of the Horizontal 20 and Horizontal 55 is placed in a horizontal angle providing more effective spin and a variety in your game. These rubbers are made in Japan and developed specially for the ABS-ball to increase the spin of the modern defensive game. The sponge hardness is 20 degrees and it is a curl p4 like rubber. Well, personally I feel that it resembles Donic 's spike P2 rather than p4, but I think that p4 has more users, so compare it with p4. What is different from p4 is that the grain is small and thin, and there is a reasonable strain. For that reason I thought that bench processing and Tsutski would be more stable than p4. I understand that Mr. Shiono's grain height involved in development is treating Tsutski tremendously and tremendously. As against pounding, the sponge has a sense that it absorbs the spirit as well as p4, so it cleaves very well and it also stabilizes. I do not feel any special novelty compared to vertical eyedicals, but I think that it is a good rubber that is balanced at a high level of stability, cutting and change. Because the sponge and grains are both soft, it feels like it absorbs the momentum of the ball considerably. Because of that, even if it cuts with the position which is not very good, it is settled to the stand stably. In addition, it is an impression that it is easy to create a variety of changes such as knuckles and cutting ripples in Tsutsuki. The attack is stable if you pull it firmly and shake it. Depending on the swing speed, quite heavy cuts can also be sent. The racket should be a racket that does not bounce very much.